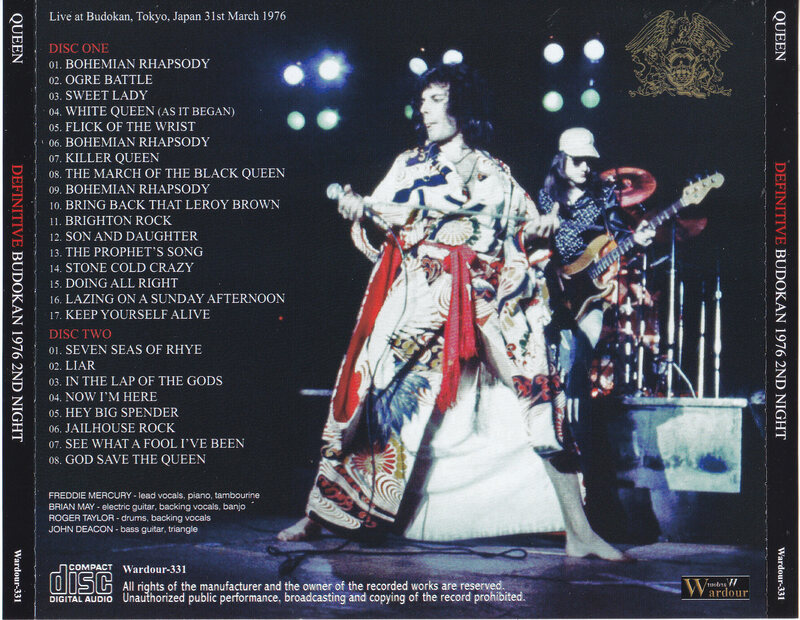 Recorded: Live at Budokan, Tokyo, Japan 31st March 1976. Sound: Claimed to be excellent audience recording. 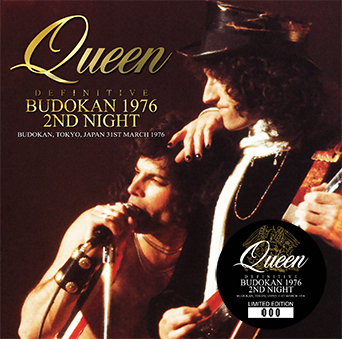 Comments: A 2CD set from Budokan, Tokyo, Japan on March 31st, 1976. This has been released before by the label in 2004 as Operatic Ecstasy (Wardour-003). Wardour claimed this 2019 release, is a upgrade from the master tape. The well-known recordings that have been acclaimed as "Japan's best in 1976" both in sound and performance have been reborn and renewed the highest peak. Of course, it is a permanent save Press 2CD! The masterpiece of that masterpiece is the audience recording of "March 31, 1976: Nippon Budokan" performance. Yes, it is an upgraded edition of the masterpiece "OPERATIC ECSTASY" which became sold out and discontinued in the popular! One year since the first visit of the legend, QUEEN has returned to Japan with the title "The Night of the Opera House" shining in rock history. In our store, we have been archived in a number of great recordings. First, let's check the position of this work while organizing the collection according to the date of that time. ・ March 23 "ELEGANCE IS AN ATTITUDE: NAGOYA 1976"
・ March 29 "DEFINITIVE OSAKA 1976 (two performances)"
・ April 1 "INVITE YOU TO A NIGHT AT THE BUDOKAN"
・ April 2 "THE PROPHECY: SENDAI 1976"
Above, all 11 performances. It was Nippon Budokan on the first day, but then we went around each place, and in the second half, we have two nights in a row. Therefore, although this work is "2ND NIGHT", it is the first day of two consecutive performances. It has reigned as the highest peak of such a show "OPERATIC ECSTASY". The recording itself has been known for a long time, but in 2004, Omoto Master excavated. The parts already recorded before then are also included, and the sound is also greatly improved. Not only did we update the highest peak of the day, but we won the acclaim of the 1976 Japan Tour All High Peak. In fact, the sound is amazing. Speaking of the 70's QUEEN's Japanese recordings, it is natural that there is a distance, and the type of how the playing sound is not disturbed by the yellow enthusiasm. There are few fans who scream around around whether it was a position near PA very much. Of course, the scene is the highest girl rate ever, so it's not zero, but without disturbing the performance, Freddie's voice comes close to me. Moreover, the balance is excellent. Each musical instrument is separated neatly, and the sense of separation does not shake even if the band is united. It was a live album in which the beautiful sound runs through. ...... And so far, the story of "OPERATIC ECSTASY". This work also has the same name recording, but is upgraded further. This time, we re-digitalized the latest equipment from the originale cassette that was excavated in 2004. Of course, just because you redigitized your vintage master is not necessarily an upgrade. In the end, there is almost no change, and the deterioration of the analog tape may progress and become worse. However, in the case of this work is a great success! It becomes a brighter playback sound than the previous edition "OPERATIC ECSTASY", and it is felt like Mokomoko even with the last edition that was felt so wonderful. Moreover, the sense of stability is further improved. As a matter of fact, some of the characteristics of the recording also include hiss, but even it is natural and kind to the ears. That's what sounds like the generation of the master Gene went up for about 2 generations (although the actual Gene can not go up because it's Omoto). That alone is a 100 point perfect score, but this work aimed at further higher. As a matter of fact, the biggest drawback of "OPERATIC ECSTASY" is the lack of tape change. Although there is less than originaly only in the group already developed, the intro of "The Seven Seas Of Rhye" is still lacking. Therefore, this work was complemented by another recording of the masterpiece "INVITE YOUR TO A NIGHT AT THE BUDOKAN". Most of this title is "April 1st" the next day, but "March 31st" which is partially the same as this work is used. And just "The Seven Seas Of Rhye" was a March 31st recording. Thanks to that, I could not only renew the longest in history, but also reprint the complete form of the show. The show drawn in such an ultimate form is the highest peak again. Freddie's voice disappears in the first half of this tour, especially in Fukuoka. When it came to Osaka performances, I was in a situation where I would be a doctor stop in a little more. However, it recovered after having taken a rest before and after the Osaka performance. In the second half, I regained the basics. The Nippon Budokan of this work is the show that will be its first hit. Even though it was doubtful, it sounds like it saved a little in the first half, but the middle stage is over and I wonder if it is completely recovered. Especially from "The Prophet's Song" which starts with Japanese MC of "Please listen", the brutal vocalization is a big explosion! When it comes to the middle part that makes use of the echo, it is a masterpiece singing voice. If even Freddie revives, there is nothing scary in QUEEN at that time. The band also has a nori, a heat performance that seems to have risen to the tempo without mind. And "Seven Seas Of Rhye". It has been sealed up to here because of the trouble, but it is released at a stretch here. I will listen to the wonderful performance. What's more, this "Seven Seas Of Rhye" is not just a treasure in Japan. In fact, it was a short version as a part of the medley when it was not played last on this day and revived after "THE WORKS TOUR". In other words, it was the last full version "Seven Seas Of Rhye" that Freddie sang. This work is also full of its overly valuable take. A live in Japan by four of those days who created that "night at the opera house". This work is a complete live album that updated its masterpiece recording in both sound and length. One of the world's greatest treasures, including Freddie's last perfect "Seven Seas Of Rhye", was born. Please enjoy as much as you want with the Press 2CD, which will leave this shine forever! ★ This time the board is equalized in the same direction as the existing board, so this time the board is brighter. (★ The texture of the 2nd generation Gene has risen) The high sound quality of the past is definitely achieved. ★ The texture is natural feeling though hiss is the same degree. ★ While the length is the same except for the compensation point, the existing game is hooked on the playing part and fades in / out. ★ This time the board is stopped from tape and hooked to hiss to fade in / out. So, this time the board is recorded slightly longer. ★ ★ This is the queen title of the year. All fans must listen and one hand.